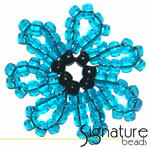 These versatile acrylic beads are 13mm. The have a large hole, which makes them easy to thread. They are ideal for kids craft activities, and can also be used for hair braiding. There are approx. 50 beads per packet. These 6mm round red acrylic beads have a lovely metallic finish. In a packet of 50g. 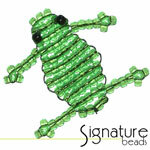 Green 12mm round acrylic beads with silver stars. Packet of 10 beads. Red 12mm round acrylic beads with silver stars. Packet of 10 beads. Lovely red 10mm acrylic round beads with a swirly gold pattern. Each bead is unique. Packet of 12 beads.